Hello loves! Just a quick post today to show you an amazing Charity Shop find of mine! I was scouring the rails of a local Charity Shop when I spotted this dazzling at me. It was a little steep for a Charity Shop priced at £11.99, but I’ve been after something like this for a long time, and not only that, one of these would cost a small fortune on the High Street. When I got it to the till, the shop assistant said I could have it for £10 as she thought it was priced a little high – even better! Its slightly baggy on me, which I like, and I can see it working really well in Autumn/Winter with a pair of skinny jeans and some statement heels for nights out. 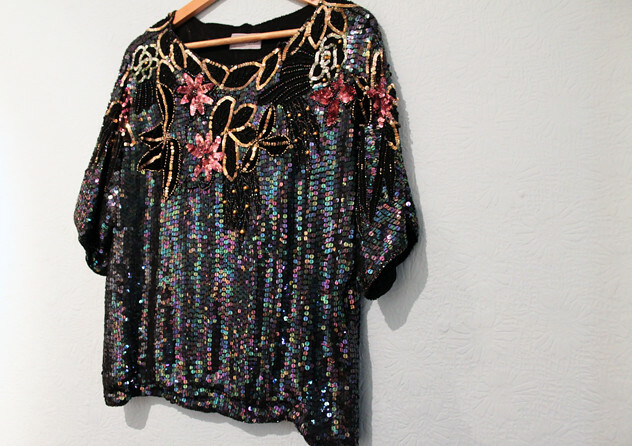 Bar a couple of sequins missing at the back, it’s in perfect condition, so I think I’ve snapped up a gem here! Oh, and I restocked my shop Sitting Pretty Vintage yesterday with some gorgeous Vintage maxi and midi skirts. Make sure you check them out! What have been your best Charity Shop finds? "WATCHED THE RAIN WASH DOWN"
Wow its amazing! I don't think £10 is that much to be honest, I know it vintage but can you imagine how much this would have been brand new? Can't wait to see how you style it up! this is such a gem! amazing find, i'm so jealous. Best thrifted find EVER. …just found your blog by the way, I love it!! I'm following now.